The Negombo is designed to combine the extraordinary therapeutic properties of thermal waters with a fun and healthy stay. The Negombo Thermal Park is situated in the commune of Lacco Ameno of Ischia. It is a mix of a spa, a hotel,a private beach and a wellness center where international events take place. Therapy, massages, aerosols, inhalations, thermal pools with hydromassage jets, here you can find everything to regenerate your body. Moreover, thermal waters can be effective in curing numerous osteoarticular diseases. The present physiognomy of the park owes much to the enthusiastic intervention of the landscape designer Ermanno Casasco. In fact in this garden, that is considered a privileged place for the relationship between man and nature, the rural landscape is complemented by the magnificence of plants from Australia, Japan, South Africa and Brazil. The park takes its name from the town of Negombo, Sri Lanka, because in 1947, the Duke Luigi Silvestro of Camerini started the works in this beautiful garden with the introduction of exotic plants such as cicas, strelizie, ficus. Negombo is a park that has a sea-water thermal swimming pools, a spa center, a steam bath and an antique therapy cave, a bar and a restaurant, a 4-star hotel and a beautiful beach edge stretching for 250 meters in the shade of the picturesque bay of San Montano, in Lacco Ameno. The Negombo Park also features a 1700-seat arena that becomes animated on summer evenings by concerts of classic and jazz music. Many celebrities such as Miles Davis and Mireille Mathieu, Tina Turner and Ray Charles, Arbore and Baglioni, Dalla and Morandi visited Negombo. The Negombo Thermal park pools include a warm/cold Kneipp course, 3 sea water pools with a perfect water temperature for children, a charming 55-degree Turkish bath and Omphalos from a greek umbrella: a cave dug in the tuff with showers of waterfall at 32 degrees. 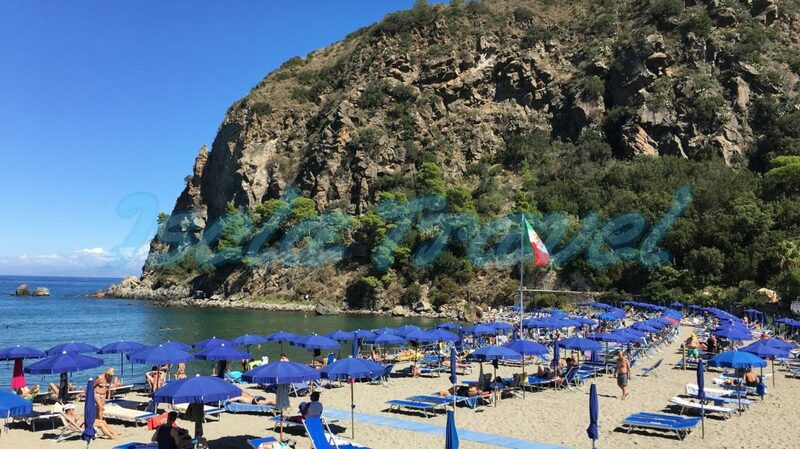 In front of the swimming pools you can find the white beach with sun beds and umbrellas, surrounded by Mediterranean maquis, overlooking the green emerald of one of the most beautiful and magical bays on the island of Ischia. The park also houses a restaurant, bar and self service and a 4-star hotel, some of the rooms have a private Turkish bath. There are badlands and independent rooms hidden inside the park which is quiet and perfect for privacy and relaxation. Do you need more information to visit the "Negombo Thermal Park"?